Have you noticed some of the large billboards are showing Mallee Rock wines in Vancouver? I saw this a few weeks ago, then was contacted about the wines. 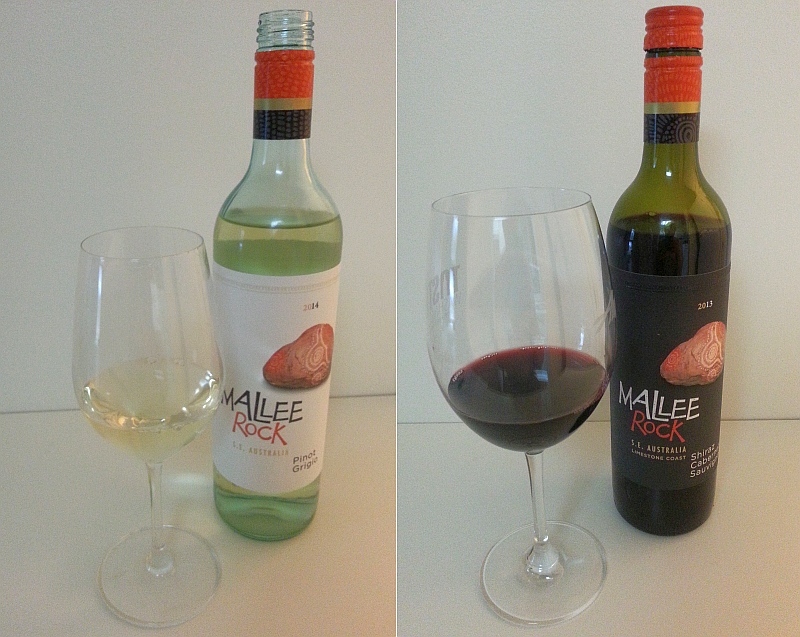 Mallee Rock Wines is from S. E. Australia and are marketing two of their wines to us; their Shiraz Cabernet 2013, and Pinot Grigio 2014. The name of the winery recalls the mallee trees that thrive in the harsh Australian landscape, and these wines show their strength of character in the same way, according to the winery. I have never heard of a Mallee Tree, so I thought I’d check for both of us. As I read on the web, a Mallee Tree is a species of Eucalytpus tree. There are 700-900 different Eucalyptus trees in Australia, and 50% are known as Mallee. 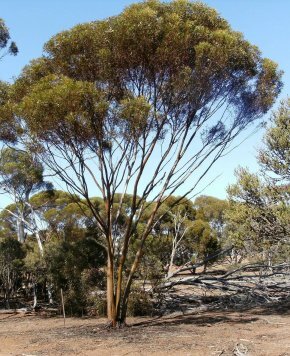 Mallee refers to a large, bulbous, woody structure called a lignotuber, or mallee root from which the stems from the tree originate. Mallees have deep roots to tap into ground water, and are a very tough, slow growing, drought tolerant tree. For most of us, when we think of red wine Shiraz and/or Cabernet Sauvignon probably jumps to mind. Pinot Grigio is probably not thought of as much, as Australia is considered a hot place to grow grapes, but there are cooler pockets in S.E. Australia where aromatic white varieties, like Pinot Grigio, or Riesling does grow. Mallee Rock Pinot Grigio 2014 (BC $12.99) – A fresh youthful nose with aromas of ripe lemon and peach, together with green fruits. Dry with medium acidity, but still a soft round feel in the mouth. Overall light flavours of peach, lime, green apples, and flowery perfume, with a green fruit edge. Medium length with mouth watering acidity and pepperiness on the finish. Rating: A straight forward light fruity summer sipper. Mallee Rock Limestone Coast Shiraz Cabernet Sauvignon 2013 (BC $13.99) – Deep ruby purple in colour. Medium intensity aromas with juicy black and purple fruit, blackberries, cassis, chocolate and vanilla, with a hint of nutmeg. Off-dry with medium tannins that will not dry out your mouth. Black berries, cassis, ripe dark cherries, ripe black plums, and hints of violet and dark chocolate flavours. The fruit is very ripe, and you also get some tarriness or molasses on the palate. Light white pepper and softer fruit and sweetness on the finish. Rating: A hot climate wine that shows this with ripe sweet dark fruit flavours. I think Aussies and Canadians like to get together with their mates and have a party. In Australia, this get together is called a “session”. They may serve Chiko Rolls (a spring roll) or Meat pies, together with bbq meats and seafood at their sessions. I was provided with recipes for Chiko Rolls and a Beef and Bacon Meat pie you may want to try making. If you do, please invite me over! Make sure that you have pulled the egg roll wrappers from the freezer a few hours before assembling the recipe. In a non-stick skillet, cook the lamb or beef in 1 Tbsp. of oil until browned and crumbly. Lamb adds more flavour to the roll, but beef is a good substitute. In another pan, melt the butter on gentle heat and add the onion, carrot, cabbage, green onions and celery and cook until softened. Add salt and pepper to the mix until it tastes good. Add the beef, couscous, brown sugar, curry powder and cornstarch and cook for another 3 minutes. Lay out 1 sheet of pastry. Place about 4 Tbsp. of mixture a quarter of the way into the wrapper forming a log shape. Cover extra wrappers and Chiko Rolls with a damp cloth to stop them from drying out and cracking. Tuck the left and right side over the mixture, brush with egg and roll the Chiko Roll up from bottom to top keeping it quite tight. Heat the canola oil in a pot on the stove until the temperature is 300F. Blanch the rolls in the oil for about 7 minutes (at this point we don’t want any colour on the rolls). Remove the rolls from the oil and let rest for a few minutes while the oil reaches a temperature of 350F. Place the rolls back in the oil and cook until golden brown. Alternatively, reheat in an oven at 400F for about 12 minutes until brown. Heat oil in a large pan. Once hot, add onion, garlic and spices, and cook until onions are translucent. Add beef and bacon and cook until brown, making sure that any large clumps have been broken down. Add peas, gravy powder and chicken stock and let simmer for about 7 minutes until a thick sauce has been made. Let cool. While waiting for the filling to cool, roll out the puff pastry and cut into rounds a little bit bigger than the tart shells (the pastry will shrink as it cooks). Preheat an oven to 400F. Place the tart shells on a non-stick cookie sheet and fill with the meat mixture Place your pre-cut puff pastry round on top and brush it with a little egg wash. Place into the oven and cook for about 20 minutes, until the top has puffed up and turned golden brown. Take out of the oven and let sit for 5 minutes before serving (this will ensure the gravy settles and isn’t too hot).